…Don’t suppose there’s any chance of an iPhone version, is there? Would be nice. Supposedly, an iPhone version is part of the package we purchased. This looks very well put together. Congrats Neil and team. I am a new subscriber. I happen to use a Windows phone. Any chance for a Windows version? I’m enjoying the stories. Thanks for editing and printing them. Unfortunately, the company we’re working with doesn’t have an Windows app. Does the Kindle app work on the Windows phone? You should be able to use that with a subscription from Amazon or Weightless. 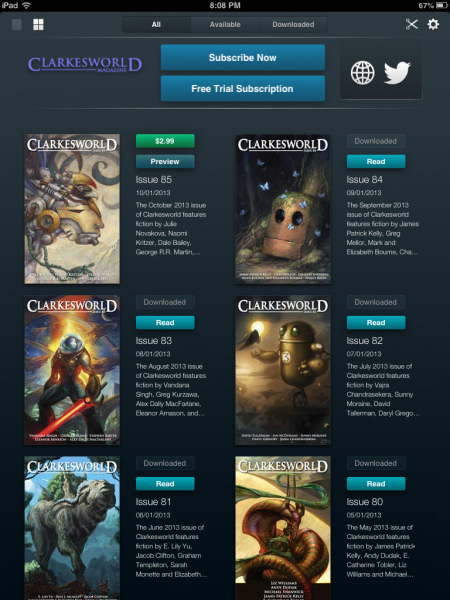 There should also be ePub readers that you could use with a Weightless subscription. I’m not aware of any newsstand app software for the windows phone, but I will be looking into after we get this project launched.